The ski resort of Le Collet d'Allevard is situated in the Belledonne area of the Isère department in the Northern Alps region. The lift served area extends from 1450 metres to 2100 metres. There are 35 km of lift served runs. 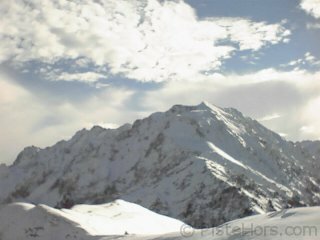 It boasts one of the largest floodlit areas of piste skiing in Europe and is a firm favourite with afterwork skiers. The resort has recently installed 5 hectares of artificial snow cover. The resort opens at the beginning of December and runs through until mid April. Their is tree lined skiing for much of the domain and also has a large 'out-of-bounds' ski area under the Super Collet lift giving skiers a varied off-piste experience in an area secured by pisteurs. Born in 1877, Antoine Cros discovered the pays d'Allevard during cycling trips in the early 1900s while he was an apprentice barber in nearby Aix-les-Bains. 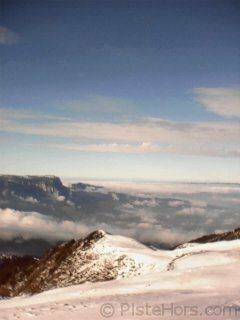 He fell in love with the Haut-Bréda area and climbed many of the summits. During the Great War a hospital was set up by the American YMCA in the Hotel Splendid in Allevard to treat American soldiers. Often from Norwegian backgrounds these men introduced skis to the area although in those days there were no ski pistes and mountains were climbed with seal skins fixed to the bottom of skis not with lifts. At the end of hostilities Antoine Cros managed to buy 28 pairs of these "odd planks" for the princely sum of 1400 old Francs and began to teach the youth of the area how to descend the surrounding slopes. The first two competitions were organized over Christmas 1922 at Gleyzin and then in February 1923 at la Piat close to Pinsot. Finally on the 13th of March 1923 with the aid of Albert Feugier and Dr Laurent Chataign the Ski-Club Allevardin was founded. There is a statue to Antonie Cros, who died in 1968, in Allevard. The first lifts were built in 1955 and the resort celebrated its 50th anniversary with a book tracing the history of skiing in the area. Le Collet d'Allevard : Histoire d'une passion partagée (1955-2005) Le livre du 50e anniversaire. Off piste is limited to a secured bowl at the Collet d'Allevard and some between the piste runs however there is a lot of ski touring in the surrounding area. 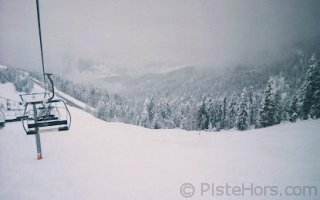 Skiing can continue quite late in the season, as an example on the 15th April 1999 I'd just spent the winter season in Switzerland and was back at my house near Chambéry before going on to a ski course in Andorra. 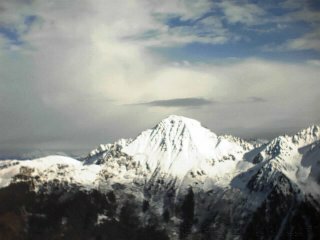 As is common in the French Alps the spring had brought warmer, unsettled weather and it had decided to dump 50 cm overnight. I went up to Allevard for the closing day. There was so much snow in fact that the upper 'Super Collet' area had to be closed due to avalanche risk. That left the lower tree lined slopes. The snow continued on and off throughout the day and what with the few skiers this left plenty of unexploited, if somewhat humid powder. 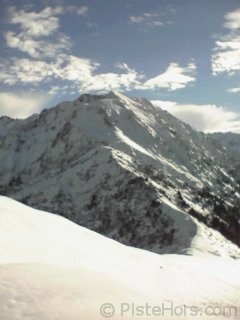 Beyond the top of the resort is les Plagnes area and the summit of hte Petit Charnier. This is often used as an early season ski tour to blow out the cobwebs although the proximity of the resort renders it esthetically less interesting. Road: A41 Pontcharra exit from north or Goncelin exit from the south. Follow signs for Allevard. Snow tires or chains required past Allevard in the winter. Rail: Grenoble TGV or Montmelian TGV from Paris. Nearest station is Pontcharra. There is a bus service from Grenoble. The nearby casino town of Allevard has many excellent restaurants including the Moulin Pizzeria.